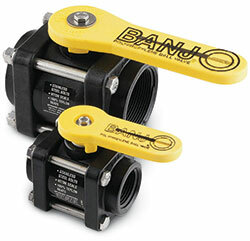 Banjo’s reliable ball valves have a self-aligning ball that moves freely against the PTFE seats for smooth operation. The ball is diamond-turned after molding to make it spherically perfect, which provides precise contact between the ball and seats. The valves open and close with very little pressure on the handle. Choose from Banjo’s standard bolted ball valves and ball valves with a 90° nozzle. The lightweight 90° nozzle models have a hose end that provides convenient liquid transfer. If you need a different Banjo valve, USABluebook has access to Banjo’s complete line. Please contact us for details.